I have to start off by saying that Bloodrush has one of the most original storylines that I have ever read. "Welcome to the wild west, he thought. Last stop before Hell." The story follows thirteen year-old Tonmerion Hark, Merion for short. The story begins in London, where we learn Merion's father has been murdered and Merion's life is again turned upside down as he learns he's to be sent to America to live with his aunt until he's old enough to take over his father's estate. Tonmerion and his friend Rhin the faerie soon make their way across the Iron Ocean to Fell Falls, Wyoming. The frontier town is a drastic change to what Merion is used to and he isn't a bit happy to be there or with his Aunt Lilain, the local undertaker. We also meet Lurker the prospector and his magpie Jake. I don't want to give the entire story away but I just have to mention the rushing. Merion learns he's a Bloodrusher as his father was which means he has the ability to drink blood from an animal or creature and take on some of the abilities from them. It was amazing how many kinds of shades there were to learn of and as I said I don't think I've ever heard of a story like that. I also love that it has a western setting, I don't read westerns so this was a nice compromise. It's a great new setting for me and the railwraith creatures were scary fun and the Shohari were an interesting lot. Overall, I loved everything about this book. Sometimes I wanted to thump Merion for the things he did but you can't help but love him and I really want to see Lurker and Lilain get together! 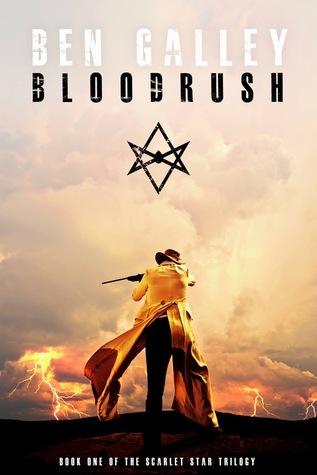 I would recommend Bloodrush to anyone who loves amazing characters (Lurker was my favorite), magick, and some mystery thrown in. "Hearts are treacherous things. At times they can beat so proudly it feels as though they will burst from your rib cage at any moment. They can drum a tune to run to, or fight to, or love to. But they are not to be trusted, for every heart will skip or slump, sickeningly so, and always when you need it not to." "It was his first acceptance of failure, of frailty and the inexorable. He hated himself in that moment. But hate can make men, and thirteen-year-old boys, do marvellous things." Ben Galley is a best-selling purveyor of tall tales and dark fantasy from the UK. He is the author behind the gritty and epic Emaneska Series, as well as the upcoming western fantasy series, the Scarlet Star Trilogy.